Include canned tuna in your repertoire in a fresh, new way with this take on tuna and noodles. 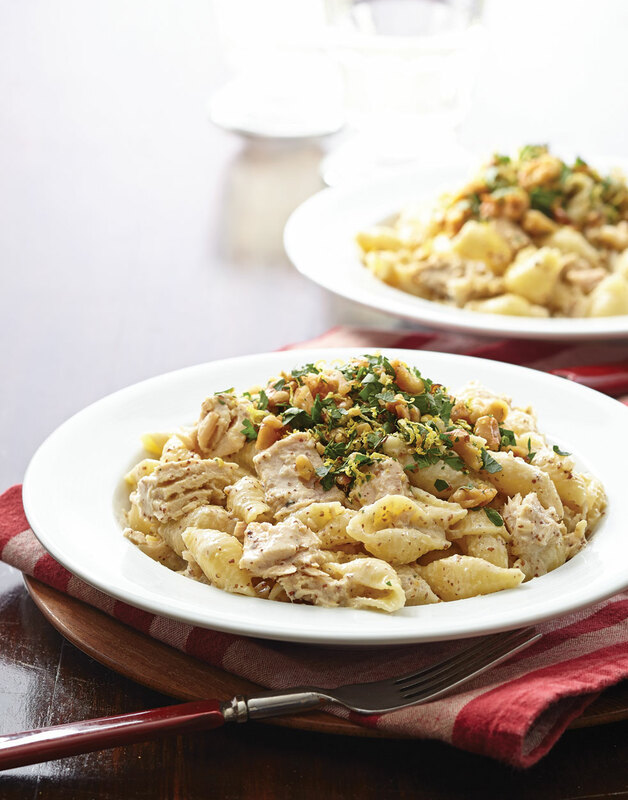 Toss shell pasta and hearty tuna with a rich, creamy mustard sauce, then top it off with a crunchy walnut gremolata bursting with the fresh flavors of lemon and parsley. For the gremolata, combine walnuts, parsley, and zest. For the pasta, cook shells in a pot of boiling salted water according to package directions; drain, reserving ¼ cup pasta water. Sweat shallots and garlic in oil in a skillet over medium heat until shallots soften, 7–8 minutes. Deglaze skillet with vermouth, increase heat to high, and reduce until nearly evaporated, 3 minutes. Add cream, broth, and mustard; boil sauce until thickened, about 5 minutes. Stir in shells, tuna, and lemon juice; season with salt and pepper. Add pasta water to reach desired consistency. Top servings with gremolata.